I remember watching the trailer for Mulaka for the first time. It struck me just how reminiscent it was of Breath of the Wild’s final trailer shown by Nintendo at their 2017 Switch Presentation. The first 40 seconds or so were almost a beat-by-beat replication of that impactful Zelda trailer: sweeping landscapes, fluid combat, epic music, and a lone hero looking out at an expansive world that was waiting to be discovered. Mulaka’s trailer emulated that final look at Breath of the Wild so masterfully, it had by attention immediately. For better or worse, this would forge a direct comparison between these two games in my mind that wouldn’t leave. Gone is the ruins of Hyrule and the familiar hero Link; in its place is the fantastical Sierra Tarahumara region of Mexico and a new hero, the Sukurúame shaman, Mulaka. The first thing you’ll obviously notice in Mulaka is the visual style. It has kind of a minimalist aspect to its graphics that lay somewhere between a Wind Waker approach and a Journey approach. There are certain areas where this looks just spectacular. Looking out over the starry skies of Arareko felt more like looking at a painting than it did a video game, and Mulaka himself is designed really cool, with lots of tattoos making his model stand out. Something I made note of as I was playing, though, was that this art style works far better for long shots of sweeping vistas than it does close up in the nitty-gritty. There are times when the camera was pulled in close and I was running by a wall and half of Mulaka’s body would disappear or it would zoom up on some unflattering piles of dirt in the corner. For as great as this game looks stylistically sometimes, there are times it looks like a early N64 game. Luckily, those moments don’t happen as often, but they happened often enough to where I noticed it and wrote it down, so take that for what you will. 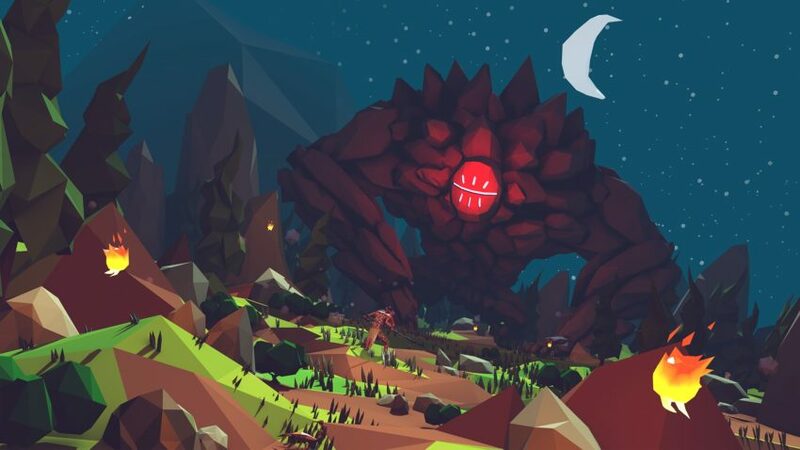 Controlling Mulaka and navigating its world should be immediately familiar to anyone that’s sunk a ridiculous amount of hours into Breath of the Wild (like this guy right here). You have your standard attack, jump, and weapon buttons, but you also have a kind of Arkham–Asylum-Detective-Vision like mode which you can switch into for as long as your magic lasts; this lets you see enemies health, secrets in the overworld, and pinpoints the next general direction you should be heading in. Mulaka also separates itself from its Zeldaspiration (Inspazelda? Wildspiration?) 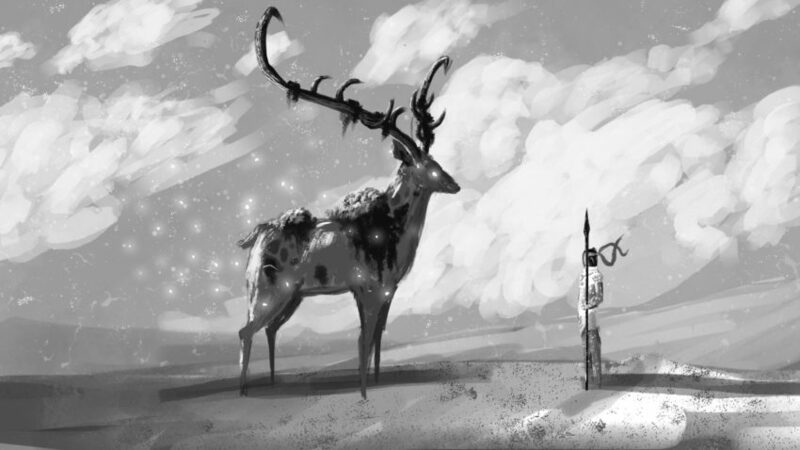 by allowing Mulaka to transform into different animal spirits for a brief period of time. These transformations work in place of items in Mulaka; instead of a hookshot taking you across a gorge, you’ll be able to transform into a hummingbird and fly across; instead of a megaton hammer smashing a big boulder, your handy bear form will take care of that. So on and so forth. Some of these transformations work better than others, that being said. The panther feels super jaggedy, and I still haven’t made sense of why, of all animals, a snake is able to traverse in water and freeze things on impact. Where Mulaka really shines is its boss battles. Combat in this game is relatively simple; there’s no combos to learn, no extra weapons to get, and no deviating from the way you fight the easiest and the baddest enemies in the game. In that regard, the boss battles offer a welcome respite. There was a really cool Metroid Prime-esq giant rock monster that required your bear and snake forms to freeze his legs and break the rocks; or a giant walking tree that would constantly bounce you off of his head (imagine fighting Bongo Bongo but 60 feet in the air and the drum moves) that required a specific blend of panther and hummingbird to land on the right spot to deal the finishing blow. The times I was having the most fun with Mulaka were the times I was utilizing all my skills to take on these increasingly larger bad guys. That being said, for all the mechanics that Mulaka drew inspiration from Zelda, it would have been nice if they decided to include a target lock-on button. There were a ton of times I was just swinging my spear like a goon in the total wrong direction because there was no lock-on and the camera jumped to a weird place on the screen. It’s a surprising omission since it’s standard in almost every 3D game. I don’t know if this was an oversight or a conscience choice, but if it was, it was a bad one. Ultimately, I think that most players overall enjoyment of Mulaka will depend upon how much they enjoy the Mexican mythology sprinkled in the game. There are lots of collectable artifacts that detail the Sierra Tarahumaran culture and history. 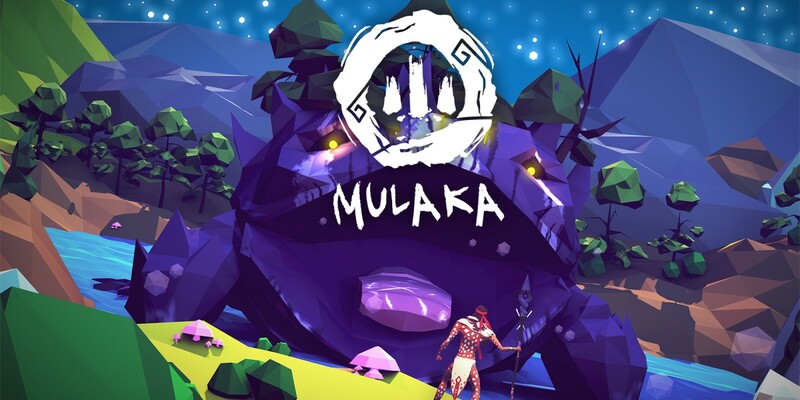 Mulaka almost serves as a learning tool as much as it does an enjoyable game, and as I played more and more of Mulaka, the less it reminded me of Breath of the Wild and the more it reminded me of Never Alone (Kisima Inŋitchuŋa), another relatively straightforward video game that leaned heavily into the culture of the indigenous Iñupiaq. Unfortunately, I found myself comparing Mulaka to both Breath of the Wild and Never Alone by the time the game was wrapping up, with Mulaka coming up short to both of those titles. Inspired By Zelda is meant to showcase new video games to fans of the Zelda series looking to play something Zelda-esq. In that regard, Mulaka would be considered a disappointment. But it’s also a matter of perspective. 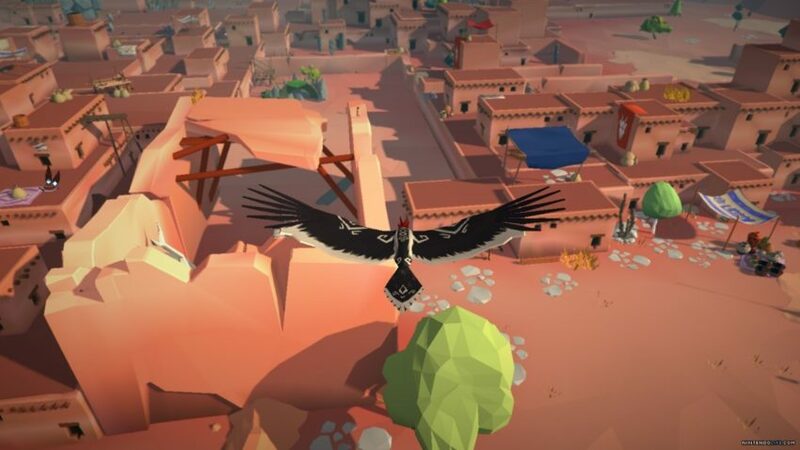 Mulaka as a video game is sub-par, but Mulaka as a cultural learning experience is an game worth playing. That’s it for Inspired By Zelda! Join me again next month as I head back to the world of mobile to explore the depths of a small kids subconscious mind in a game that serves as somewhat of a spiritual successor to Link’s Awakening! Until then! Andy Spiteri is the Editor-In-Chief of Zelda Dungeon. If you have suggestions for him to play in any future Inspired By Zelda’s, let him know on Twitter!